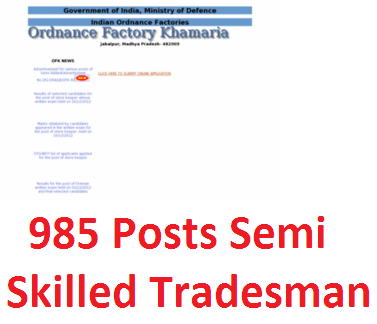 Apply online application to Ordnance Factory, Khamaria (OFK) Recruitment 2016 for 985 Semi Skilled Tradesman. Education qualification: Matriculation or its equivalent, National Trade Certificate (NTC)/ National Apprentice Certificate (NAC)/ issued by NCVT (DGET, New Delhi) in relevant trades. Age relaxation is applicable up to 40 years of age (up to 43 for OBC, 45 for SC/ ST) departmental candidates, up to 10 years addition for PH candidates of SC/ ST/ OBC as per rules. Khamaria (OFK) website www.ordkham.gov.in from 07.05.2016 to 28.05.2016 & send the hard copy of the application to Post Box No-2091, Adyar Post Office, and Chennai on or before 11.06.2016. 1. Log on to the Ordnance Factory, Khamaria (OFK) website www.ordkham.gov.in. 6. Make the payment by debit/ credit card/ Net Banking.